Office 365 tenants with First Release enabled are beginning to see the new Outlook on the Web features, while the remaining tenants will see the updates beginning in early September. 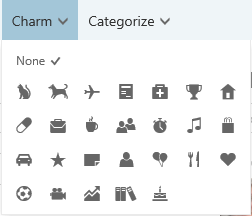 Outlook.com users who have been migrated to Office 365 have the new Outlook on the Web features now. As a first order of business Outlook Web App was renamed Outlook on the Web. If you don't like it, you can provide feedback in UserVoice. I'm just kidding about leaving feedback on the new name, but they would like your feedback and feature suggestions, and votes for the ideas you like the best. To access the OW user voice (after your account is updated), click Feedback under the gear icon or use this link: Outlook on the Web UserVoice. The new Action toolbar is a quick access toolbar for the most common commands you'll use, including new commands such as Pin, which allows you to pin important messages to the top of your Inbox or other mail folders so you can find them easily. To pin a message, hover over the message and click the pin icon. Click the pin icon again to unpin it. The new Sweep feature is based on simple rules and allows you to move or delete messages from a specific sender after they arrive or after a period of time. At this time the rules are limited to Archive or Delete all messages from a sender, all current and future messages, messages older than 10 days, or keep the current message and move or delete all older messages. The Archive button provides a way to quickly file messages you're finished with into the Archive folder. Before using Sweep to archive messages, you'll need to set up an archive folder. Simply click Archive and select the folder you want to Archive mail to. OW has two improvements to the single line view for users who prefer a single line list of messages instead of the compact view with the reading pane on the right. In the Office 365 OW, the subject field includes the first line of the message - how much of the message you'll see depends on the width of your browser. When you click a message, it loads the message in the same window (similar to Outlook 2016's small form factor behavior). Once your tenant is updated, you'll be able to apply actions to multiple messages. This works the same way it does on mobile devices: add a check next to the messages and move or delete the selected messages. You can even select the messages visible onscreen in one click. Yes, you can select multiple messages now, but it works better in the new OW. New features in compose messages includes the ability to resize images, add custom borders, apply shadow effects, and rotate images. 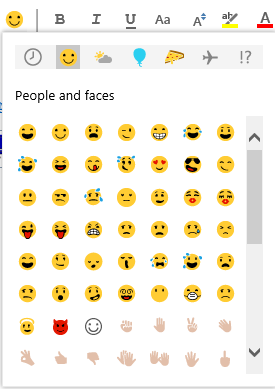 You can even insert emojis into your messages easily. Calendar updates include a 5-day forecast (for up to 5 locations), with icons indicating the forecast. When you hover over the icon, a popup shows a more detailed forecast. You can add charms to appointments so you can see at a glance what type of event it is. Separate birthday and holiday calendars are also available. A much requested feature is available in OW: email reminders. You can create up to 5 email reminders for any Calendar event. You made a comment on other post that we can change registry to not have "on behalf of" on outlook. I was wondering if you can have the same settings so emails that I send out from O365 Outlook on the Web does not have "on behalf of"? No, you can't use a reg key to change anything in outlook on the web. The only way to avoid 'onbehalf of' is to have Send as rights to the address. This might seem like a simple or silly question, but is there any way to change the destination folder of the one-click archive button on the web version of O365? I create a new 'archive' folder under my Inbox for each year, and I can't see a way to reflect that! Rename the folder you have set as the Archive folder - the next time you archive, the dialog comes up asking for the archive location. Hmm. This worked last night but when i tried it today to grab screenshots, it didn't work. Archive picks up the folders new name. Thanks Diane. Great article. We have an "issue" - maybe. We have the in-place archive setup and a policy applied. However, when we use the new Archive commands (right-click or button), it asks to setup an archive - and we can't see the In Place archive folder at all. Any ideas? That archive is for an archive folder in the mailbox. It's meant to replicate the Archive feature found in mail apps on smartphones where you can swipe to arhive email. AFAIK, it won't use the in-place archive.